Having read some less than enthusiastic reviews of Lanark prior to going to see the production, I wasn’t holding out much hope for the adaptation. However, David Greig and Graham Eatough have produced an engaging and arresting production of the (very long) novel by Alasdair Gray. 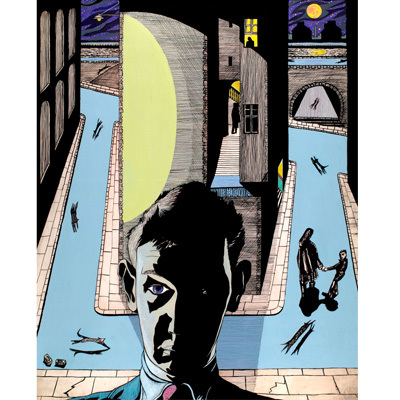 Starring Sandy Grierson, the play follows the ultimately unremarkable life of Lanark, a man of undetermined age and origin who wakes up in the city of Unthank with no memory of who he is or where he has come from. Like the novel, the play begins with Act Two followed by Act One and finishing with Act Four. This only alleviates the mysterious atmosphere throughout the whole play, as we as the audience don’t know anything of Lanark until Act 2. The play is a powerful combination of fantasy and realism, with the fantastical parts still strangely relatable and significant to the real world. It is a sorrowing tale of false expectations, and trying to make the ordinary life sound extra-ordinary. The production on the whole is very dark and enigmatic, with low lighting and not much of a score, mirroring the events taking place on stage. With only about ten cast members, each playing completely different characters in each Act, it felt there was a close and personal connection with the audience. The most interesting part for me was the way in which Lanark’s inner thoughts were portrayed, with each cast member representing part of his brain, making it easy to follow the conversations he has with his inner safe and the inner struggle he faces. The use of this also meant that despite the three acts not being in order, it was very simple for us as the audience to still follow what was happening, rather than be left in an awkward state of confusion. While the three acts came from Gray’s novel, this unique set up made it easier to watch as it meant regular intervals, as opposed to sitting there for four hours continuously. The stage set up also added to the gritty feel of the play, mainly set up of scaffolding of which the cast members were not shy of climbing all over during the play. Very worth of a mention is the point where we are to believe that all of the characters are inside Gray’s head, where Lanark ‘leaves’ Gray’s brain and the stage is very cleverly set to look like we are inside Gray’s head looking out, achieved by using just the metal scaffolding. While normally I cannot stand it when productions break the fourth wall, this was so cleverly done that I had to appreciate it.